Cecil Stedman is The Government Guy™ in the Invincible super-hero setting by Robert Kirkman. He first appeared in 2003 in a Brit story. So he sort of occupies the same general niche as Nick Fury or Sarge Steel in the Marvel and DC universes, but a bit differently. Group Affiliation: Global Defense Agency. Base Of Operations: The Pentagon, United States of America. Though Cecil has no real superhuman powers per se, his body no longer requires rest in the manner that normal humans do. He literally no longer needs to sleep. As a former field agent for the Global Defence Agency, Cecil has received extensive training in hand to hand combat, firearms and all manner of stealth and espionage techniques. He is also a capable leader. Over the years has risen in stature until he personally commands the entirety of the Global Defence Agency itself. Though he typically works behind the scenes, Cecil is a gifted orator and possesses a charisma that few other men possess. Cecil has full access to all of the advanced technology that has been made available to the Guardians of the Globe. He makes almost exclusive use of the American Government’s “Door” technology. That allows him to travel instantaneously across the continental United States through the clever creation of warp gates. Through the use of this astounding technology, he always keeps a contingent of “Reanimen” close at hand. In addition, he is seemingly always armed with a heavy grade plasma pistol. Due to his exposure to the highly caustic compound Chemical X, every inch of skin on Cecil’s body has been replaced with a highly realistic looking artificial compound that exactly mimics skin. This compound is highly durable, flexible and warm to the touch. The only limitation that the artificial organ has is that it must be immersed in a very specific chemical bath for an hour out of every 24 that pass. If not, it will immediately begin to break down and disintegrate, exposing Cecil’s damaged flesh and nerves to outside stimulus. The circumstances in which Cecil Stedman first joined the Global Defence Agency is clouded by hearsay and misinformation. But several facts present themselves upon close examination. He was an exemplary field agent from the beginning and was often sent into the most dangerous situations. Most of these involved individuals that possessed superhuman abilities. Over the course of his adventures, Cecil developed a close working relationship with the superhuman agent Brit. The two came to depend on one another. Cecil’s racked up an impressive string of successful operations until he encountered the Order of the Freeing Fist. The Order had a simple plan. They took over a heavily industrialized area and planned on detonating a bomb. It would release the highly toxic Chemical X throughout an unnamed area in North America. They believed that the resulting deaths would inspire the nation’s youth to live life to the fullest, knowing that each and every moment might be their last. Cecil failed to stop them from executing their plan. It was only the last minute appearance of Brit that forced them to prematurely trigger their bomb and succumb to their own weapon. Unfortunately Cecil was at ground zero, having being bound to the weapon. Thus, he received a full doze of the highly caustic Chemical X. The entirety of his skin was eaten and burnt by the vicious attack. Cecil’s will to survive outweighed the damage done to his body. With the aid of the highly advanced medical technology possessed by the GDA he survived the experience. Weeks passed. When he had recovered the only sign that anything had even happened to him was a patch of scarred tissue on his face. Stedman demanded that they left intact to remind him of the price of his one failure in the field. Cecil returned to active duty. His life returned to a semblance of normalcy until the Pentagon itself was attacked by the Lizard League. While the League was indiscriminately murdering any and all members of the GDA they came across, Cecil was attempting to escape the confines of their headquarters with director Radcliffe in tow. Unfortunately for them both, they encountered the League’s most vicious killer Komodo Dragon before they could slip away. Cecil attempted to fend off Komodo with his sidearm. But the weapon had absolutely no effect on the lizard themed warrior. Cecil steeled himself for what was to come, but before Komodo could strike, he was attacked by the Order of the Freeing Fist. Shock played over Cecil’s face as he watched the supposedly dead terrorists that ruined his life and body, render Komodo unconscious. He turned a stunned look to Director Radcliffe who hesitantly explained that he had faked the Order’s death in order to enable them to come and work for the Agency. Their crimes had been pardoned in return for their allegiance. Cecil disagreed vigorously, and with two swift shots gunned down the members of the Order with abandon. He was taken into immediate custody by the GDA and remained there for several months. Cecil was eventually released by Director Radcliffe when Radcliffe was looking for a replacement for himself. With time, and most likely many conversations, Radcliffe had convinced Cecil that at times it was necessary to work with “devils” in order to preserve the greater good. With that Cecil became the most powerful man on the planet. He began to cultivate his growing influence and power, and struck up partnerships with several of the heroes that walked the Earth. He made an arrangement with the Viltrumite agent Omni-man. That allowed the GDA to direct his adventures to areas and threats that only he could handle. It was despite the fact that he realized early on that Omni-man’s heroism wasn’t as altruistic as he claimed it was. Stedman also worked closely with the Guardians of the Globe, and he eventually became their handler of sorts. When the original Guardians were murdered, Cecil drove the reformation of the team under the direct auspices of the GDA. That made them a fully licensed part of the American Government. He recruited the teenaged hero Robot to lead the new team, and indirectly chose the team’s lineup. When Omni-man’s treachery and murder of the Guardians was eventually revealed, Cecil took immediate action. He went about containing the damage that the Earth’s mightiest hero was in fact its greatest villain. 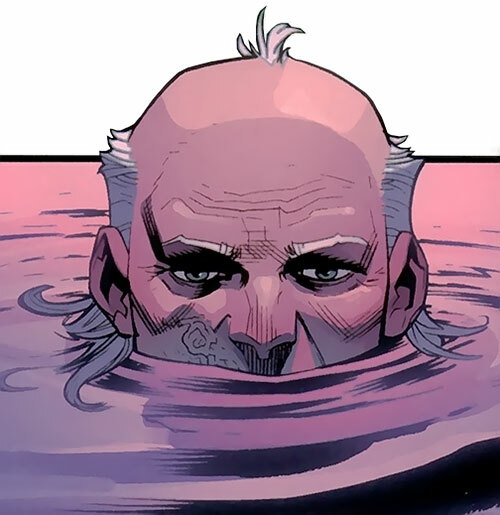 He faked the death of Omni-man’s civilian identity and took steps to ensure that his family was provided for. While these actions may have appeared to be altruistic, they were in fact very calculated. The goal was to convince Omni-man’s son, Invincible, to take his father’s place as the GDA’s top operative. Invincible predictably accepted Cecil’s offer. From that point forward, much of Cecil’s life was focused on trying to rein in and control the impulsive Viltrumite hero. 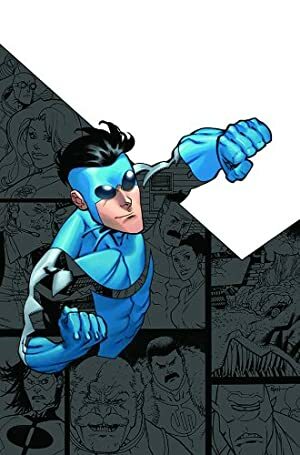 Unlike Omni-man, Invincible was both impulsive and defiant. If he felt the situation warranted it, he would ignore Cecil’s authority and commands despite the fact that he technically “worked” for him. Despite this, Cecil didn’t simply release the young man from his control. Invincible was simply too valuable and more importantly, powerful, to allow to roam freely without supervision. In the meantime, Cecil continued to build his power base. He supplemented his forces with some of the murderous villains that Invincible himself had captured. He granted a form of amnesty to the formerly psychotic sidekick Darkwing, and to D.A. Sinclair the creator of the Reanimen as well. He put the two criminals to work secretly as he realized that public knowledge of their freedom would be sure to cause friction with his peers and employees. Eventually the Guardians and Invincible found themselves facing a situation that they could not overcome alone. Cecil had to make a call. He chose to reveal his secret reserve force and unleashed Darkwing and Sinclair’s Reanimen into the fray. Their timely aid allowed Invincible and his allies to turn the tide and win the battle. But upon its completion, Invincible confronted Cecil in the Pentagon. He simply could not stomach the fact that Cecil had decided to allow murderers to go free in order to have more “tools” to be used to defend his interests. Cecil tried to talk his teenaged agent down before he reacted with predictable violence but found himself unable to do so. Unfortunately for Invincible, Cecil had been preparing for this precise moment from the second he found out Omni-man had been a traitor. 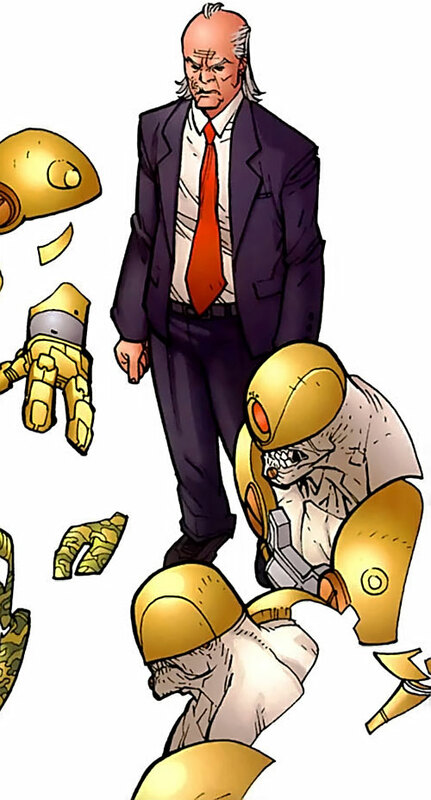 In the second before their debate turned ugly, he triggered a sonic weapon that he had built into Invincible’s communicator before it was implanted in his ear. The device caused Invincible intense pain, threw off his balance and forced him to retreat from the Pentagon. Realizing that if he allowed the young Viltrumite to escape and remove the implant that the repercussions would be horrific, Cecil teleported after him in a series of short hops. Stedman was eventually able to catch up with him at the Guardians of the Globe’s Utah headquarters. When he arrived, he gave the assembled Guardians an ultimatum, stand aside and allow him to take Invincible into custody or join him in a cell. The Guardians that were present sided with Invincible and were immediately set upon by an unleashed army of Reanimen that Cecil had prepared for just such an emergency. The fight seemed to be going in Cecil’s favour until the sonic weapon that he had used to incapacitate Invincible was jammed open. As a result, the Reanimen set upon the young hero with a viciousness that Cecil hadn’t been prepared for. He attempted to call them off, but was unable to. At the last possible second, Robot managed to jam the frequency from the sonic weapon. This freed Invincible to act. In a fit of rage, Invincible destroyed the Reanimen and confronted Cecil directly. Cecil was forced to endure the young man’s anger, while he was warned not to bother either him or his family again. Time passed. As her performed his duties Cecil was forced to endure a strained relationship with Invincible. Despite their mutual dislike, Invincible was simply the most powerful hero in the world. Thus, threat after ugly threat forced Cecil to seek out his aid. Then, Angstrom Levy set 20 extra-dimensional doppelgängers of Invincible upon the unsuspecting world for three terrifying days. It was only the interference of Invincible and his allies that allowed the villain to be defeated. Immediately after that, the Viltrumite agent Conquest attempted to pacify the planet. Only Invincible’s Viltrumite strength was enough to halt his rampage. Cecil realized in that moment, that the greatest threat to the planet wasn’t necessarily the Viltrumite that he knew, but rather the Viltrumites that he didn’t. With that in mind, he commissioned the creation of a special group of Reanimen. These were created from the corpses of the Invincible doppelgängers. Stedman then sought to mend the relationship he had destroyed with the young hero. He even offered him a position of leadership within the Guardians of the Globe if he would return. Invincible politely refused Cecil’s offer. But the two began to take the first tenuous steps towards a truce. It was just in time for Invincible to once again leave the Earth, alongside his treacherous father, to participate in the Viltrumite War. Invincible eventually returned to the Earth, with no less than Omni-man in tow. He bore news of the end of the immediate Viltrumite threat. Cecil was grateful for the information, but realized that all was not as it seemed. Invincible eventually revealed that the 37 remaining Viltrumites had taken up residence on the Earth in exchange for the peaceful resolution to the war. Left with little choice, Cecil was forced to accept Invincible’s pact with the aliens. Shortly thereafter, Invincible renewed his conflict with the superhuman threat known as Dinosaurus. When he failed to halt Dinosaurus’ plan, the entirety of Las Vegas was reduced to glass. Cecil, seeing the destruction as an opportunity, had a massive bank of solar panels built upon the former city. This provided massive amounts of clean energy for the continental United States of America. Shortly thereafter, Cecil managed to capture Dinosaurus in his human form. He imprisoned him deep within the Pentagon. During this time, Cecil and Invincible continued to work on their on again, off again relationship and the two came to an understanding. Cecil realized that somewhere along the line, Invincible had come to see the world in shades of grey. Nothing would be black and white to the youth again. With this in mind, it shouldn’t have been a surprise to Cecil when Invincible freed Dinosaurus from his imprisonment but it was. Cecil was forced to name Invincible an enemy of the state and set the Guardians of the Globe after both him and Dinosaurus. But it was truly an empty gesture. He hoped that he could reason with the young man that had somehow become a friend to him. The point was quickly made moot though, when Invincible lost his superhuman abilities due to exposure to the Scourge Virus. With Invincible incapacitated, Dinosaurus ran amok. He set in motion a series of events that damaged the polar icecaps. This flooded virtually all of the coastal cities across the planet Earth. Millions were murdered by his actions. Not even Invincible’s returned powers could save them all. Cecil, working with Robot and all of the Guardians of the Globe, managed to create a series of artificial moons. These generated gravity fields strong enough to abate the flood waters and allow the people of the Earth to begin reconstruction. At the close of this event, Invincible surrendered to Cecil. The youth stated plainly that he didn’t trust his judgement going forward. Rather than imprison the young man, Cecil was lenient and demanded only one thing from him; a return to their original working agreement. Invincible agreed to Cecil’s terms and the two continue to protect the Earth to this day. Cecil is an old, grizzled looking Caucasian male with thinning stringy white hair and piercing blue eyes. His hair falls long in the back but is obviously thinning on the top of his head. He is not the type of man to smile lightly, and can almost always be found with a serious look upon his face. On the right side of his face, running from the side of his mouth to the back of his cheek lies a puckered and angry-looking scar. The scar has been depicted as both flesh toned or slightly discoloured. It is all that remains of his original skin. Cecil can always be found wearing a suit, a white dress top, an off-colour tie and black dress shoes. Cecil is a unique individual with a singular focus. His only desire is to protect the people of Earth. He will go to any lengths to accomplish that goal. If that means resorting to questionable methods, working with criminals or betraying his allies then so be it. Cecil expects uncompromising loyalty and focus from his subordinates. He drives them mercilessly towards their goal. He tends to avoid creating personal connections with his employees (or people in general). This is because emotions tend to cloud one’s judgement when it is critical to making a logical decision. In several cases, he hasn’t even bothered to learn his employees names. He has a policy in place regarding personal effects within his office space. This being said, he still has a sense of compassion and is able to form personal relationships. He simply has chosen not to over the years. Of all of the people he has encountered, he is closest only to Brit, Donald Ferguson, Invincible and Omni-man. Credentials (American Government, High), Credentials (American Intelligence, High), Credentials (UN, Low), Headquarters (Expansive, The Pentagon), Life Support (No Need to Sleep), Rich Friend (GDA), Iron Nerves, Leadership, Sharp Eye. The Actioneers (High), Brit (High), Capes Incorporated (Low), Donald Ferguson (High), The Guardians of the Globe (High), Invincible (High), Reanimen (High), Tech Jacket (Low). Age (Old), Authority Figure, Creepy Appearance (Scarred Visage), Miscellaneous (Cecil suffers from the equivalent of a 04 AP Cell Rot attack if he doesn’t immerse himself in a special chemical bath for at least once hour per day) , Secret Identity (Head of the GDA). Earpiece [BODY 01, Radio Communications: 05, R#02. Bonuses & Limitations: Radio Communications are Scrambled (+1FC)]. Plasma Pistol [BODY 03, Energy blast: 07, Ammo 08, R#04]. While Cecil hasn’t actually demonstrated the ability to do so, one would assume that he can speak several languages in addition to English. The most likely candidates are: French, Mandarin Chinese, Japanese, Russian, German. Cecil is still very spry considering his age, but he has most likely lost a step or two with age. In his youth, his DEX was 04. Writeup completed on the 2nd of Feb, 2014.